Manchester United's world record £750m kit deal with Adidas will be cut by 30% if they fail to qualify for the Champions League in consecutive seasons from 2015-16. The German sportswear giant could also cancel the contract if the club get relegated from the Premier League. United failed to qualify for any of the European competitions this season after finishing seventh in 2013-14. 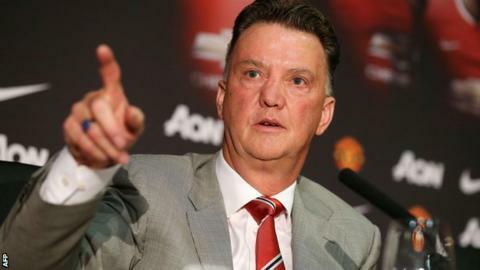 They will want a big improvement under new manager Louis van Gaal, 62. Van Gaal was as successor to David Moyes earlier this summer. Details of the deal with Adidas, which was announced earlier this month, emerged after United offered more of their shares on the New York Stock Exchange. United announced on Wednesday that they would sell eight million shares, around 5% of the business, after selling 10% in 2012. About $150m (£88.7m) will be raised with money going to the Glazer family, the club's US owners. United have also been warned that interest rates on part of their £351.7m debt may rise. A prospectus reveals that the deal with Adidas features a number of conditions. Failure to qualify for the Champions League in consecutive seasons from 2015-16, when the contract begins, would see payments cut by nearly one third. However, United could benefit from an extra £4m per year if they win the Premier League, Champions League or FA Cup. Should the club be relegated from the Premier League, the manufacturer can give 12 months' notice to terminate the contract and reduce payments in half for every season spent outside the top flight. The shares offering comes two months after the death of owner Malcolm Glazer. His six children control the club and will retain more than an 80% stake. In 2005, the Glazer family paid £790m for United, borrowing £500m and paying the remainder in cash.